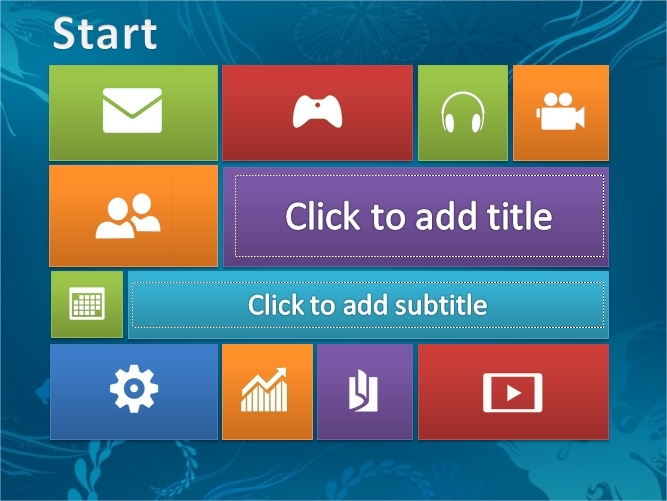 Inspired by Windows 8, Windows 8 4presentation.net Animated templates offered. Design templates already with Hyperlink, the link to the slides that have been determined simply by clicking a box that is provided. The inscription on the box can be changed at will or according to the title page slide to be addressed. for example “Go to Slide 2” can be changed by writing your own. Mark “Start” is a home that is a hyperlink like you can go back to the start screen Windows 8 slide that. When the the start screen include with multiple animations such Fade, Pulse, and Teeter effects. WordArt formats to the title of the presentation with a white design fused with windows 8.
windows 8 Animated templates will make your presentation more interesting and professional. what are you waiting, Just download it.